I was planning on going to see Scott Pilgrim this weekend after my wife got home from work, as the only showings were apparently after 11, which would make it easy to go to. Unfortunately, the theaters have bed bugs so I decided to stay in and catch a flick in my dvd pile instead. My choice? 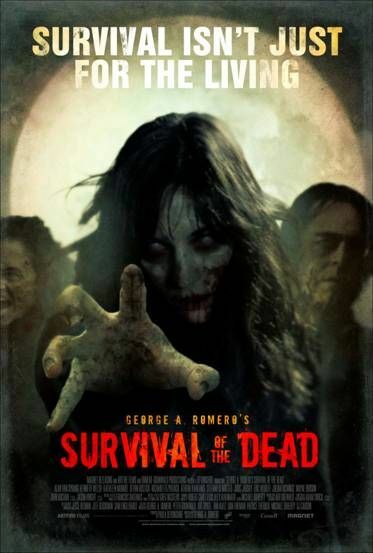 Survival of the Dead, by George A. Romero. In this latest installment of the Dead series, we follow an AWOL team of National Guard members, several of whom were last seen in Diary of the Dead robbing the protagonists of that film. You even get a video recap of it. They, like anybody else in the world of the dead, are just looking to find a place to get away from everyone and have a place of their own they can survive the end of the world. The Colonel and his squad find Plum Island, where according to one of the inhabitants, they can live in peace. Turns out, that's a bold-faced lie as said inhabitant is part of a feud between families and just looking for someone to back his attempt at insurrection. Mayhem ensues. So, how does the newest installment hold up in a series that is, what, about 40 years old? Pretty well. You can stick this movie into several places along the timeline without trouble. At this point, though, the movies are feeling less like epics about the end of the world and the human condition and more like little vignettes that combine ideas from the main series in a different part of the world. The story is a little weak but the actors do a good job with the material and we get several sympathetic characters and several batshit insane ones. The gore is plentiful though some of the CGI shots are rather sketchy. All in all a solid movie, though it does pale compared to the main four (Night, Dawn, Day & Land). With Diary and Survival, we get a new, lower budget series that is more interconnected than the others, with characters intersecting at parts of each others' stories and then going on to tell their own. Romero says he has several more planned if the sales on this one do well and I'm keen to see them after this. Judging by the empty racks at Best Buy, it's doing well the first week it was out, forcing me to go to Wally World instead to get my copy. I will admit that I would like to see Romero diversify a bit more, as I am a huge fan of Bruiser and enjoy his non-zombie works quite a bit. Still, I'll take what I can get from one of our masters of horror who keeps putting out quality films, even if he isn't getting the budgets that he used to. Not much to report as of late. Haven't watched anything of note, movie-wise, though I'm dying to go see Scott Pilgrim since I'm a huge fan of the books. I have been reading a ton of books though, so that's something and probably why I haven't watched much in the way of flicks. In particular, I've been reading the Dresden Files. I read Storm Front, the first book, about three years ago. Since I got the Kindle, I've gone through eight books in about two weeks. At this rate, I should be caught up on the series through book 13 in no time flat. They're great reads and any fan of fantasy should check out the series, which involves a wizard/private eye. Housework, today. Gonna install some pegboard and try to clean up the garage and downstairs. I really need to find a place for all of my tools so I can get them all easier. Updated version of the music video coming soon. While it was rendering, I watched this little documentary last night about the Friday the 13th series. Documentary might be not the right word for it, as it was basically a puff piece with people who were remembering the series as either fans or stars/crew members. They didn't really shed much new light on anything but it was a decent way to kill an hour and a half. It's hosted by Tom Savini, who, using the haunted house based on the series in Universal Studios, punctuates each segment with screams and gore. The interviewed members ranged from Sean S. Cunningham, the director of the original and pretty much father of the series to random cast members who you don't even remember in the films and everyone in between. They were noticeably lacking Thom Matthews, who as Tommy Jarvis in part 6, was one of the few human males to give Jason a run for his money consistently and not die doing so. They covered the film, but not a ton, which is unfortunate, as it is one of my favorite ones due to the humor element and the fact that this is where they changed Jason into a zombie/undead monster for the most part. I wasn't a fan of the seemingly tacked on puff piece about the then new remake coming out, as they didn't tell you much about it and it was just everyone talking it up saying how it was going to be awesome. It was good, that is for certain, much better than Freddy vs. Jason. Kind of a crappy coda to end on though. It would have been fun if they got Kevin Bacon to reminisce about his role in the first film as well, but to no avail. Worth checking out for fans of the series. Finally have a rough cut of the music video we were working on. So far, the only change has been the title, which was missing an all important "The" at the beginning. I have thusly changed it and re-posted it for your viewing pleasure. Courtesy of Rob at Rucksack Films. New cut: 8/15/10. Color graded some of the footage different and added strobe and noise and blur to some as well. Looks a lot better in quicktime where you can see some of the subtle changes better. Youtube kinda glosses over them. Still, looks closer to the other footage so they mix better. New cut: 8/30/10: New footage placed in at the end. Took a day trip down to my brother's house to see him and his family and also to play some magic in a little tournament. This is the second time we've done this such thing, where we buy ten packs apiece and form a deck out of them and play to win some more packs. Last time it was Zendikar where I lost but got some great cards. This time it was Rise of the Eldrazi and I lost again (though I won one game in the loser bracket) and only got some middling cards. No mythics whatsoever, whereas one of the players got like 8 and Dave pulled a damn Gideon. In all fairness, I told him I wasn't going to be the one pulling him from a pack. I'm sure a better player could have made something good out of the cards, but in all the colors, I was missing something to push it over the top. I think removal would have been the missing component. Too many things on the board and all I had was consuming vapors vs eldrazi spawn, which means all the big targets get missed by it. Ah well. It was fun time. At least in the downtime between a match I got to test my vampire deck, which did well against Urzatron. God bless the bloodsuckers, and with only five mana for the whole game. Fortunately, that covered all my big guys and I kept pulling good cards. If it got really bad, I could have tossed out a Sign in Blood but I did ok.